“Solomon’s” name is mentioned in The Quran and Bible. The Quran introduces Solomon as a good servant and one of the prophets who have been given knowledge and wisdom. The word “wisdom” has been repeated 20 times in The Quran and it referes to Luqman, David, instructions of Prophet Muhammad and The Quran. The The Quran considers knowledge as the basis of Solomon’s government and mentions it as the foundation of evolution and change inhumane society. And talks about Solomon’s extraordinary power and excludes the scope of his country which was spreaded all over the world. 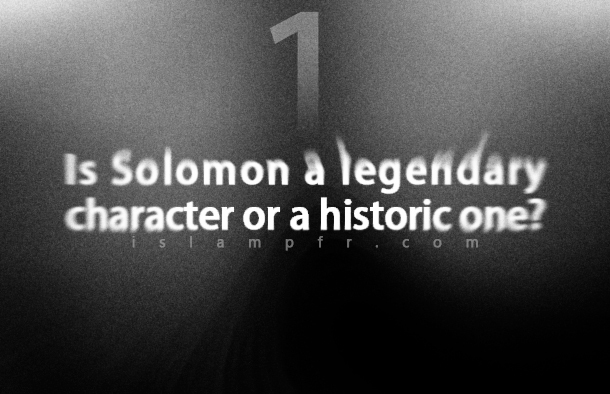 However, the Israelites know Solomon as one of their kings. Solomon’s government and his wisdom was the best among the kings that were ruling in the Jerusalem. Some parts of Old Testament such as book of Proverbs, Ecclesiastes, Wisdom of Solomon and Songs of Songs are related to Solomon. When human beings could not discover the secrets of the world, they used legend to explain the reason of incidents. They got help from their imagination to do so. The legends had different aspects. The most important aspect of a legend is to cultivate perfection and moral virtues. Legends were both constructive and destructive. In fact, they constructed the souls of human by virtues and destroyed the mind of a human being when he wanted to explain the reason that is laying behind incidents. In post Islam centuries, Jamshid and Solomon, were considered one person. According to Iranian stories, Fars that was the capital of legendary Jamshid, was considered Solomon’s capital and the kings of Persia were considered Solomon’s deputy and heirs to the throne of Solomon. According to Iranian national stories, Jamshid or Jam is a legendary character and is one of the greatest kings of the Pishdadian dynasty in Iran. . He reigned for 650 years and there were no sicknesses and death in his kingdom territory for 300 years. When Jamshid did bad things and became a dishonest man, he lost his power and his kingdom was ruined. (5) Eventually, Jamshid went astray, he became arrogant and he was ruling tyrannically. Therefore, people overthrew his monarchy with the help of Zahhak. Jamshid escaped from his enemies for 100 years. Eventually, they found him near China Sea and killed him by cutting him into half by a saw. In the Persian literature, the cup of Jamshid is attributed to Solomon and the seal of Solomon is attributed to jam. The fame of Solomon in Abrahamic religions is because his name is mentioned in Bible and The Quran. Solomon is recalled a lot in The Quran and Bible and the history of his life is mentioned there. He is praised a lot in both of these holy books. However, some parts of the Solomon’s pure life are distorted in the bible. Criticisms that are made to Bible show that, this book is written by a human being and original Bible was distorted, so there are wrong things in it. Commentators of The Quran bring beneficial articles about Solomon for the verses in The Quran which are about Solomon. Allameh Balaghi mentions these issues in his book which is named Al-huda ela din al-Mustafa. While The Quran approves causality, it says about some phenomena which are not possible by typical issues which exist in cause and effect philosophy. In fact, abnormal and extraordinary factors cause them. These phenomena are the miracles which are attributed to some prophets including Solomon. These issues (miracles) are not impossible by themselves and wisdom does not recognize them as impossible things but the difference between normal events and miracles is in the way they affect people. In fact, normal events affect people in normal trends but in miracles, impression is fast and instantaneous. By comparing what we read about Prophet Solomon in The Quran and the Bible, it is easier to know Israelites. By taking a comparative look at the mutual characters that are mentioned both in The Quran and Bible, some hidden points about them will be cleared and legendary looks about these historical people will be wiped out. The name of Prophet Solomon is mentioned in 7 Chapters of The Quran and in 17 verses of The Quran, and there are 47 verses about Prophet Solomon in The Quran. There are two points of views about words of The Quran. Some groups of etymologists believe that “Solomon” is an Arabic word. According to them “Solomon” is diminutive of the word “Salman” and it is derived from the root word “Selm”. (13) Some orientalists such as Lagarde and Lidzbarski, believe that the etymologists who believe Solomon is diminutive of Salman are right. Lagarde uses the words “Zoayferan” and “Zafaran” as an example to prove his claim. The social and intellectual environment of Prophet David and Solomon was completely different from others. These differences had led them to form a divine government to fulfill their monotheistic goals. The Quran reminds of Prophet Solomon as the son and heir of Prophet David and mentions “To David we gave Solomon” (chapter 38- verse 30), “And Solomon was David’s heir” (chapter 27- verse 19). Solomon is David’s heir and God has given many precious blessings to David. David story is narrated respectfully in The Quran. In some interpretations of The Quran, there are some narrations about Prophet David and the wife of Uriah which are originated from Old Testament. Regarding this Allameh Tabatabayi has written: “This story has been taken from Torah except that Torah has mentioned it more hideously while it is more moderate in Islamic quotations.” (17) Following this, Allameh quotes from Oyun Akhbar Al-Reza that: It was asked from Imam Reza (PBUH) that what the story of Prophet David (PBUH) with Uriah was and Imam Reza answered: “In the period of Prophet David if a wife’s husband was died or killed in a war, she was not allowed to marry another man any more. The first time that God made it possible was for David and God let him to marry the wife of Uriah who was killed. The prominent characters of the Bible are classified into different groups. In Judaism each of these groups have different functionality. These characters can be classified into 5 major groups, while some of them can be classified in several groups. Abaa (Prophets) like Ibrahim, Isaac and Jacob. Prophets like Moses and Aaron. Kings like Solomon and David. Arbitrators like Samuel, and priests like Eeli. On an evening in spring when David went on the roof of his castle, he saw a women who was bathing. After investigating about her, he found out that the woman is Bathsheba, the wife of Uriah who is one of his commanders. In that period, Uriah was in war. David ordered to bring that woman to him. And after that he slept with that woman. The woman went back to her house and informed David that she is pregnant. Then, in an attempt to seduce Uriah to go home and do what was intended, , David invited Uriah to a party and drank him wine to make him drunk so maybe he will do what David intended. But Uriah did not go back to his house again and slept together with the guards of the king. The next day, David wrote a letter to Joab, commander of Uriah, and asked Uriah to give it to Joab. In the letter it was written when the battle gets tough, leave Uriah in the front line and let him die. 26. “Raa” (راع) in Hebrew means a person who does bad things. Why is marriage sacred in Islam?